Here’s more of what I’ve found inside iMovie (2013). 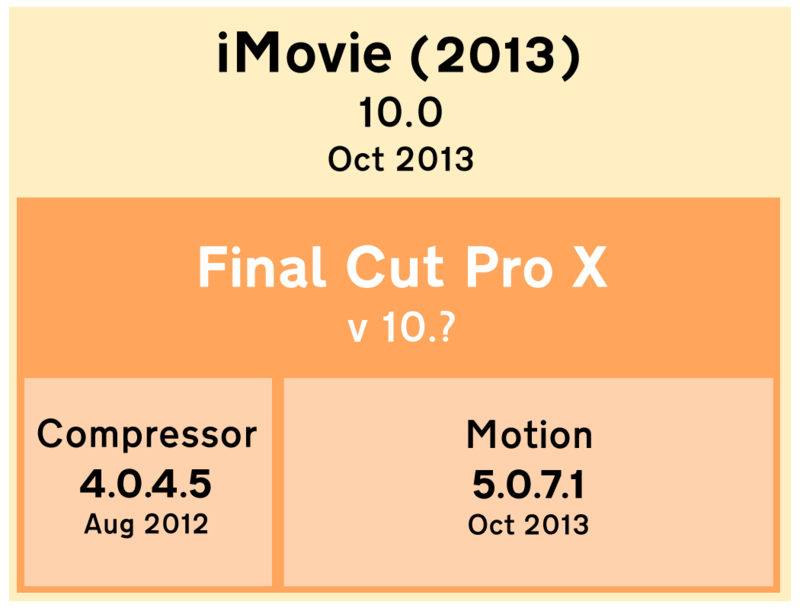 As I wrote in part 2, the new OS X version of iMovie is based on an unreleased version of Final Cut Pro X. Previous versions of Final Cut Pro X have UI-less versions of Motion and Compressor. In that case have the Motion framework and the (313 MB) Compressor plugin also been updated as much as Final Cut Pro X? Oddly enough, alothough there are new elements in the ‘Final Cut Pro X’ part of iMovie, the version of Compressor that is included is older than the version available on the Mac App Store or via software update, and there doesn’t seem to be anything new in the Motion framework. The Compressor code supports the background encoding features and sharing to online services features of iMovie. As well as US-based services, iMovie 2013 has presets that encode and upload files to Youku and Tudou. There also presets for DVD, BluRay, Compressor, Image Sequence and HTTP Streaming – but these are probably left over from Final Cut Pro X version 10.0.X. It is odd that Motion doesn’t seem to have been updated. For seven out of the nine Final Cut Pro X updates from version 10.0.0, Motion was updated in lock step. Over the last two years I’d guess that bugs that seemed to be in Final Cut were in the built-in Motion framework, so the standalone Mac App Store version was updated at the same time. Although Motion’s file format didn’t change with each update, each edition of the Motion app stored its version number in the documents it saved. In previous versions of iMovie, most of the effects, transitions, generators and titles were implemented using Quartz compositions (small files used to create UI animations in OS X and iOS apps). iMovie (2013) replaced these with Motion templates – the files used to implement plugins in Final Cut Pro X. That’s why it is possible to place Final Cut plugins inside iMovie (as I showed in Final Cut Pro X plugins work in iMovie 2013). 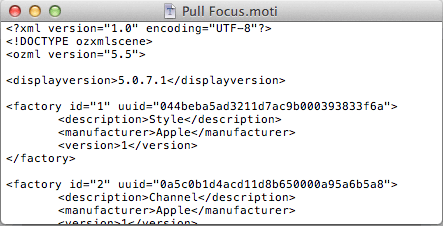 Motion’s version number hasn’t incremented in this way before – adding ‘.1’ as a fourth number. Even when an update was a maintenance release with no new features, the third number increased from 5.0.0 up to 5.0.7 (released in March 2013). If the future of Motion as a tool for creating Final Cut plugins is in doubt, what could be the alternatives? Although some people are worried at the lack of AppleScript support in recent Apple applications, there’s a possibility that future versions of Final Cut will be more controllable using a scripting language. 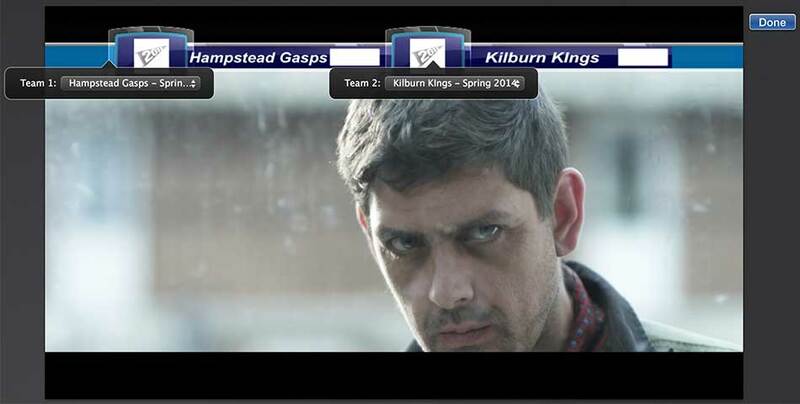 Quartz Compositions were used to implement effects, titles, transitions and generators in previous versions of iMovie. Quartz Composer is an Apple developer tool that can create these node-based animation files. FxFactory from Noise Industries was introduced as a system that allowed Quartz Compositions to implement advanced plugins in Final Cut Pro Classic (It now also acts as a plugin management system). There’s also the chance that Final Cut Pro X 10.1.X will be able to use plugins created in the free Quartz Composer developer application. …implies a difference between Quartz Composer effects and Quartz Composer iMovie effects. ANIMATION IS NOT COMPATIBLE WITH AVFOUNDATION. Open the file with Mica, and manually set the beginTime to zero. EXPENSIVE LAYER. It has filters, or a non-rasterized shadow, or a non-rasterized complex font such as SketchBlock or Shababa. The Mica document ‘%@’; has an unknown published layer ‘%@’. Please check your spelling. It seems that Mica documents also work in iOS. It is possible that Mica is used by Apple to create plugins that work in iMovie on iOS as well as on the Mac. Mica might not be made available to users and third-party plugin developers. @Alex4D: Has anyone heard of an animation/compositing tool from Apple called ‘Mica’? @BroadreachMedia: that was the code name of Shake/Motion combo. @BroadreachMedia: well there were rumours of another app joining fcpx et al. Would make perfect sense with new Mac Pro OpenCL power to have RT Shake. On the other hand, this is not to say that Motion won’t be updated when Final Cut Pro X 10.1.0 is launched – it might be that the Motion code they plan to release wasn’t ready to be included in iMovie.